We love beer fests because breweries bring their beer to us. At BeerHoptacular, the food will come to us, too–in the form of food trucks. It’s hard to pin down just what’s so fun about food trucks. It’s probably the combination of many little things. The novelty of ordering food from a restaurant with an engine. The bustle of the cooks in that tiny kitchen. Receiving that big basket of food, with all its colors and promise, down through a window. Enjoying the open air and sun the whole while. Did someone say “lobster roll”? I have to admit I didn’t know there was such a thing, but when I first heard of it I said, “I want to go to there! !” Started by a guy whose family has been in seafood for a long time, the Happy Lobster made a TimeOut Chicago list of best food trucks. What looks good: Um, the Lobster Roll, obviously. But the Fried Haddock Sandwich could sway me, too. What looks good: Korean Chili Chicken Baowich, Pork Belly Baowich, the aforementioned Kimcheesy Rice Balls. 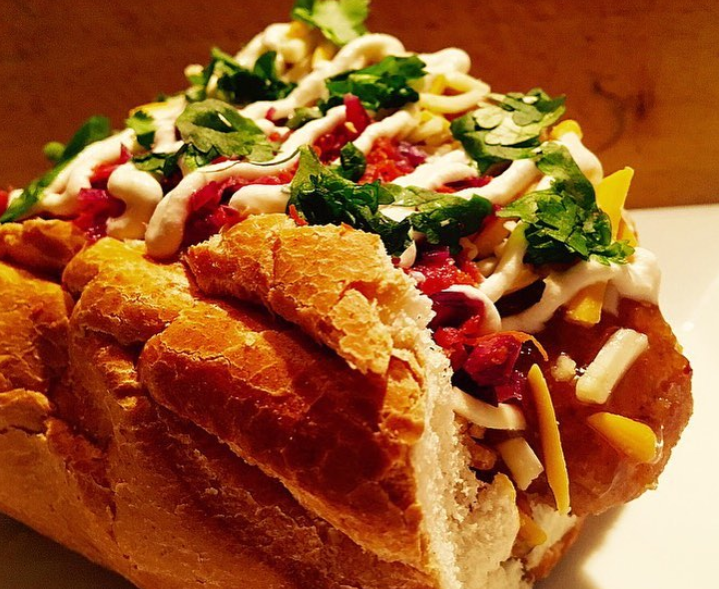 There’s sandwiches, and then there’s sandwiches built by Rogue Curbside Kitchen. Starting with a canvas like ciabatta or a French roll, they layer delectable ingredients in unique flavor pairings, like braised beef short ribs and cilantro (Gone Rogue), and shrimp tempura and sriracha aioli. Each is served with a side of fries and satisfaction. What looks good: The Scoundrel, which sounds like just that: Pork, ham, Swiss, pickles and mayo-dijon on French bread. Meat sweats ahead. Carnivale is basically the spicy Latin party you wish you were cool enough to be invited to, but in your mouth. So you’re kind of invited. Offering a mix of shareable plates and big plates that you won’t want to share, indulge in signatures like guacamole and ropa vieja, or classics like a Cubano and fries. 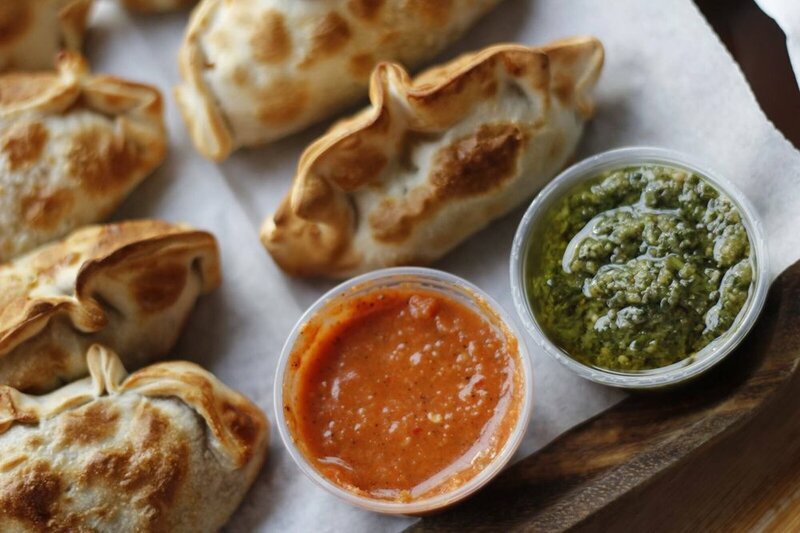 They are the complete package, too—can you walk away without trying a surprise empanada? We’ll see. What looks good: The Arrachera combines savory skirt steak with sweet papaya, refreshing cucumber, morita and cilantro. I’ll take two, thanks. We love dough in Chicago. We prefer you use all the dough. That’s why we are crazy about the incredible treats from 5144 Empanadas, which are a combo of delicious fillings inside a sheath of dough. They have unique versions like Malbec beef and ratatouille, traditional like chorizo & patatas bravas, and sweet varieties like banana and Nutella. What looks good: The Bacon, Dates & Goat Cheese empanada sounds like a least one step up, perhaps two, from the vision of empanadas you have in your head. For the less adventurous, they still have you covered with BBQ Chicken or Ham & Cheese. 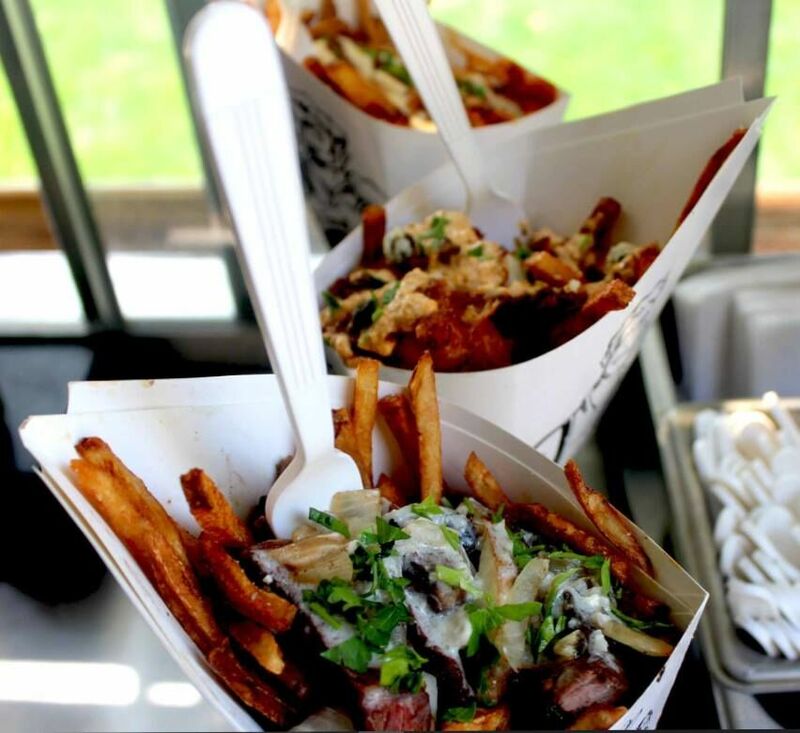 Fries usually play second fiddle, but NOT for the Bruges Brothers. Touting Chicago’s Best Fries, you’re not going to get a sad, greasy sack of potato sticks from these dudes. Instead, you’ll get the Canadian right-of-passage poutine, or a cone filled with “frites” topped with things like buffalo chicken, mushrooms, or rib-eye. You’ll never look at a potato the same way again. What looks good: The Braised Oxtail Poutine sounds like heaven dripped down into a paper cone for us to eat. For the more traditional types, there’s a take on Fish and Chips that will tickle your fancy. Nicky Copland is a writer with a background in all things uncool, including stints working for insurance professionals, home inspectors, lawyers, and neurosurgeons (they were cool). She recently moved from Chicago to Indianapolis, where she lives with her husband, toddler, two cats, and a lot of anxiety. When she isn't wiping butts both literally and figuratively, she's enjoying beer, food, hockey, and sleep, occasionally.